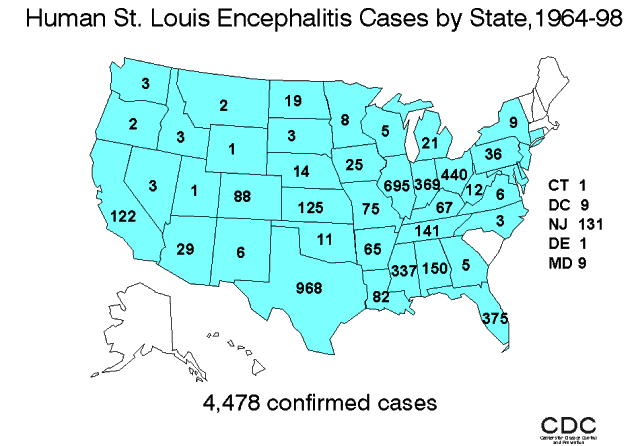 Saint Louis encephalitis virus (SLEV) was first described following an outbreak in St. Louis Missouri in 1933. Since then, more than 50 outbreaks and numerous epidemics have occurred in the United States and southern Canada. A major outbreak occurred in 1964 in Houston involving over 1,000 cases. In 1975, a record 1815 laboratory documented cases occurred throughout the entire midwestern United States, as far east as New York, Pennsylvania, New Jersey and Washington, DC, and as far north as Ontario, Canada with more than 200 cases confirmed in Illinois, Ohio, Indiana and Mississippi. The SLEV virus cycle involves Culex mosquitoes and birds. The four recognized mosquito vectors of St. Louis encephalitis in the United States are Cx. tarsalis, Cx. pipiens, Cx. quinquefasciatus and Cx. nigripalpus. While infections with SLEV have been diagnosed from most states in the U.S., the majority of cases have occurred in the east central states, Florida, Texas and California (Figure 1). According to CDC, most persons infected with SLEV have no apparent illness. Initial symptoms of those who become ill include fever, headache, nausea, vomiting, and tiredness. Severe neuroinvasive disease occurs more commonly in older adults. In rare cases, long-term disability or death can result. There is no vaccine or specific treatment for SLEV infection and care is based on symptoms.